Bronze medals are the medals you pull out when mom comes over to see what you have been up to. They are the medals you look at and think: man, I wish I had gotten the silver. Or the gold. They are the bait cast to catch something better, the next time. Frederick city brought home the Bronze from the League of American Bicyclists. They give out yearly rankings to cities and businesses around the country. The rankings are as follows: pat on the head, you are doing something right but you got a failing grade, doing ok, and Portland. We’re one step above pat on the head, anda one step below doing ok. Basically what the League has said is: your heart is in the right place, but your bike infrastructure is not. Or in our case, almost entirely lacking. 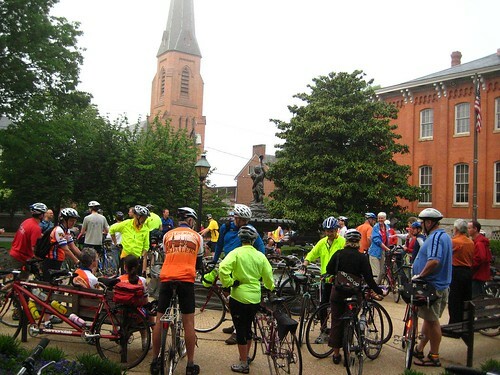 Riders gather for bike to work day in downtown Frederick, photo from Frederick’s own ‘Singlespeed Outlaw’. Here is what is working: close ties with the government. We are lucky. Frederick is fantastic in that you can actively and influentially participate in the government. You can hang out with mayor, the aldermen, the transportation planner. They are all legit, friendly people. Who happen to be bureaucrats. This means that they have to work with in the letter of the law, and as with any law, there is due process and that means time. Change is slow, even when everything looks good, and everyone is on the same page. There are multiple eggs to juggle, and to keep them all from breaking, that juggle is a slow, careful one. Large scale projects like bike lanes must be balanced against the other needs of the city. Everyone that should want to do them is on board, but they are also on board with say, the expansion of the airport and all of the logistics that concerns. So we play the proactive waiting game, and continue to work toward that silver or gold we can proudly put on the mantel for anyone to see, even your crazy aunt from Portland. We have our projects: the pump track, the ongoing struggle against codes and committees to put bike racks downtown in convenient places, the expansion of the bike lanes, the revised planning for the East Street corridor, but our projects must fit in with an existing governmental frame work, and nothing will happen over night. Here is what we still need to do: raise awareness. This doesn’t mean preaching about bike advocacy to people who already know about it, but rather it means riding our bikes more, demonstrating how easy and practical it is to use a bike to get around. It means helping the neighbor fix their old huffy up so they can head downtown for a bite to eat, or it means fixing the flat on some kids bikes so they can go to the library. It means talking about bikes as a necessary means of alternative transport, used by tons of service workers in Frederick, to name just a small segment of those who often ride bikes. We have to approach advocacy and our hopes for the silver and gold metals with an eye towards inclusion, a sense of community, and hope for a sustainable future. Let’s go for silver here in the next few years, and gold within 10. We can do it. All we have to do is pedal. 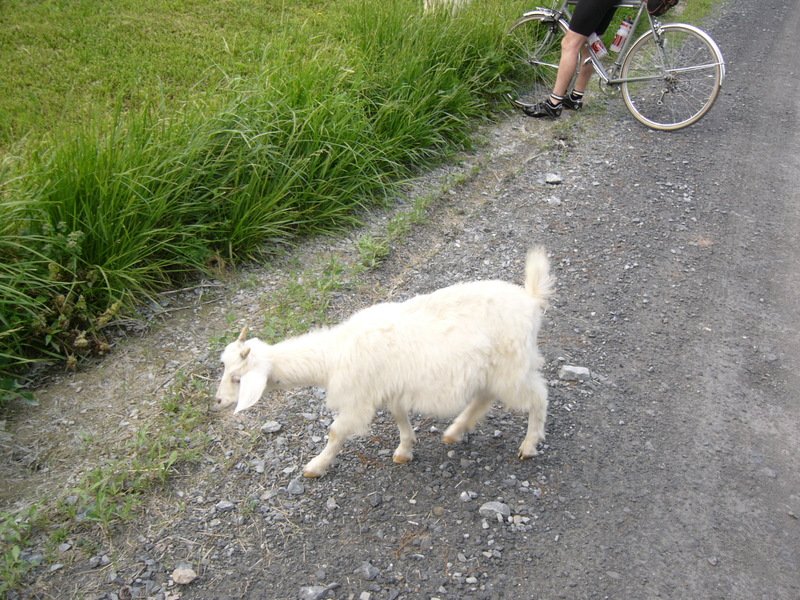 Join us and this goat on our shop road rides. You always wanted to race a goat. Admit it. Sunday evenings, at 5.30, meet at the shop for a group road ride. We’ll head out and explore some less traveled roads in the Frederick area. You’ll need: a spare tube and something to pump it with, a tail light and possibly/probably a headlight, and a road bike you aren’t afraid to get dirty on. Almost all of these rides have at least one dirt road on them. It goes till around dark, sometimes a little after… Casual pace but hard roads… !!! Clarification: you can ride these rides on a road bike. 100%. If you have a slightly fatter tire, say, a 25 or 28mm wide fella, that would be better, but not necessary. You can do this on whatever. A mountain bike would be bad. 90% of the ride is paved. If you have never ridden a dirt road, try it. They have low traffic, are generally scenic, and are a great change of pace from the usual road ride format. They are not: going to automatically give you a flat. If anything you are less likely to flat on a softer road surface with less glass and debris worked into it than on pavement. They are not: going to beat the crud out of you unless you run some horrible high pressure which you shouldn’t do anyway. They are not: going to cause you to randomly fall unless you panic and lock your arms up, but that would happen on asphalt too! Wednesday evening shop ride with Brian. This is THE CLIMBING RIDE, pretty quick pace. The route is up Hamburg road, a real corker of a climb, and then decisions are made from the top of the climb as to the route. Back to the shop at dusk. A tail light isn’t a bad idea. Follow our twitter feed for up to date info on ride cancellations due to weather, illness, alien abduction. The Bike Doctor Crew of Pernicious Purloined Pink Poppies.